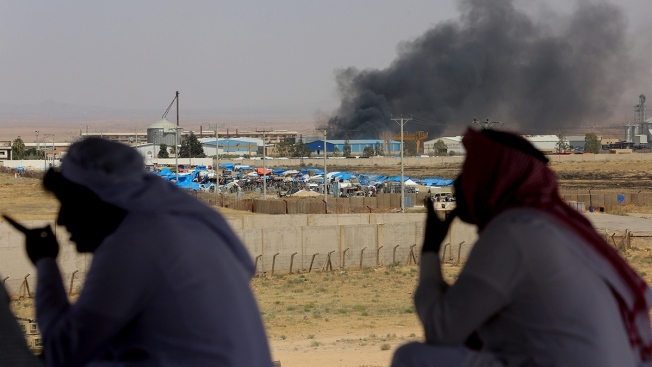 Jordanian residents of Jabir village watch aid deliveries to Syrians fleeing government offensive in the south as smoke from unknown fire rises, Tuesday, July 3, 2018. The UN says Syria government's Russian-backed offensive to recover southern territories from rebels has displaced hundreds of thousands of people. Syrian and Russian forces launched a wave of air strikes against rebel-held areas in the southwest and pushed into a major town on Thursday, resuming a wide-scale offensive after negotiations between Russia and the rebels collapsed. The government's advance in the southern Daraa province, which began on June 19, has captured wide areas and forced an estimated 330,000 people to flee their homes. Opposition activists say scores of civilians have been killed. State news agency SANA said Syrian troops entered the southern town of Saida after intense clashes with rebels, many of whom later withdrew to the nearby village of Taiba. The Britain-based Syrian Observatory for Human Rights reported some 600 airstrikes in Daraa province, including on rebel-held parts of the contested provincial capital of the same name. The Observatory said that with the capture of Saida, Syrian troops are now about six kilometers (4 miles) from the Naseeb border crossing with Jordan, one of the main goals of the offensive. The opposition's first responders say they evacuated the wounded from Daraa and nearby villages. The latest wave of attacks comes after a four-day pause during which rebels negotiated with the Russians about how to end the violence. The airstrikes resumed on Wednesday afternoon after the talks collapsed. "These were not negotiations but pressures, dictations, threats and humiliations," said Ibrahim Jabawi, spokesman for the rebels' joint operations room. He added that the Jordanians are working on resuming the talks between rebels and the Russians in southwestern Syria. Jabawi said the Russians had insisted that the rebels hand over their weapons before discussing any other topic. He said the rebels refuse to hand over their weapons "immediately" but would do so in later stages when the displaced begin returning to their homes and Iran-backed militiamen withdraw from the area. In northern Syria, meanwhile, the Kurdish Hawar news agency reported an explosion in the town of Manbij, where dozens of people were demonstrating against the Turkish military presence in the country's north. The Observatory, which has activists around the country, said the blast wounded 10 people in the town, which has been at the heart of a dispute between the U.S. and Turkey. U.S.-backed and Kurdish-led forces seized the town from the Islamic State group in 2016, but Turkey views the Kurdish fighters as terrorists because of their links to insurgents across the border and has demanded they withdraw. Washington and Ankara recently reached a deal aimed at easing tensions that would see the Kurdish militia pull out, but it has not yet been implemented.